Trek through The David Scott’s Trail! It was a nice and calm morning when my mobile alarm rang at 6:30 AM and the temperature read 10 Deg C in my wallpaper application. I was reluctant to wake up on a Sunday morning. But one of my senior’s words “It will be a great experience, DO NOT miss it”, echoed in my ears. In next fifteen minutes I was having tea with bread and butter in the mess. I was greeted by my friends from EcoBiz club who arranged this day long trek from Ladmawphlang to Mawphlang through David Scott’s trail. David Scott was a political agent to the British Raj, arguably an all-round bad boy, who left behind a hilly road in his name 180 years ago, that remains in bits and pieces even to this day. The trek was very exciting one for me, because it was a much needed moderate trek after my Jambughoda hill trek in Gujarat. We wasted no time and soon twenty eight of us boarded our SUVs and set out to Ladmawphlang. After a brief stop on the way to fill up our backpacks with chips and biscuits, we reached the entry point of the trail. It was a spotless and simple entry which anyone would barely notice. I was optimistic about that, because no quality and real trek places have a demarked and lavish entry. The sixteen kilometer trail greeted us with a gentle breeze freshened up my mind. I forgot all my project submissions, deadlines, club and committee works. David Scott’s trail and my friends surrounding me was my world for that day. I already knew that, I would remember this day for a long time to come. But the trail had its own reply. After nearly a four hour walk past the village, the broad stone way path took a stunning turn into a weir. I could imagine how roaring the river would have been on a season’s peak 600 years back. I could not fathom the impact of flash floods in the valley, as it could easily be termed as the ‘death valley of Shillong’. The path became narrower and narrower, taking diversions at unexpected places. At one such diversion, we had to do a Sherlock Holmes to identify the foot trails of our friends, who were a little ahead, in order to stay on track. We took a short break at the crossing of the rocky Umiam River. After some sandwiches munched and photo sessions, we set off to our ‘session of the day’. The military-built oscillating hanging bridge formed the perfect entry into the forest. Without worrying much about its resonating frequency, we cleared the high grown grass to make our way and set out on our own trail. There were wild chestnut trees, rhododendrons and oak species everywhere. The guide took us through a route he knew well, which took sharp turns around streams, slippery rocks and edges of the valley. It was not at all scary, it was blissful! What would ideally be called as a tiring and backbreaking journey, appeared rejuvenating and scintillating. Our closely knit team became closer. Some played their favorite songs, some were simply talking to each other and some were simply enjoying the moments of oneness with nature. After climbing almost 1500 meters from where we started, we reached a hill top and all of us were filled with a sense of euphoria. We could not trace back the path we had travelled, a metaphor to life, reflected my philosophical self. We were truly proud and pleased with ourselves. So began the celebrations with photo shoots. However the guide had his own ideas. 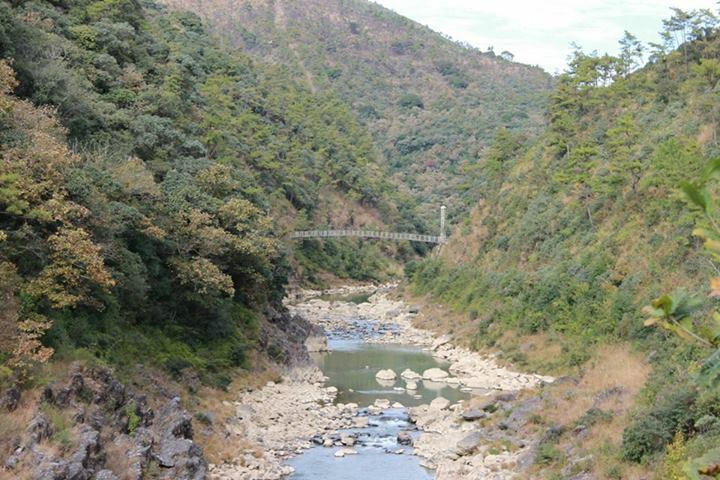 “We have just crossed Ladmawphlang forest, the sacred forest of Mawphlang is to be crossed. Buck up guys”. It was a not an unknown terrain, as we had already trekked in this forest once before. But winter had taken its toll on its green covers. It appeared less green and its streams appeared thinner. Nevertheless, the forest was still mystifying, especially when the sacred quotient of the forest was considered. It is a curse to cut or take away any of the belongings of the forest. The forests have been surviving thanks only to this virtual protection, may be a myth or a mystic element. After an easy 40 minute trek, we reached the Mawphlang, a small clean agricultural village, previously a planter’s attraction for its Captain Hunt’s small pub and his Cherry brandy. Sadly both are no more. After the much awaited poses and reposes on the famous grass carpets of Mawphlang, we set out on our journey back to the inevitable, demanding framework-lives that awaited us, only to update our Facebook statuses to “An experience of a lifetime” and “One hell (heaven) of a trek”. About the writer – Jayaraman is a first year participant at IIM Shillong. His interests include music, novels, expeditions and films.